According to the World Health Organization, 3000 people die on the world’s roads every day and several million are injured or disabled each year. 124 people are dying every hour and hundreds are becoming severely disabled and injured. In addition, road accidents cost about $ 600 billion to governments in different economies, a figure that is equivalent to the combined GDP of almost all the developing countries in the world. Have a look at the WHO data below from 2002. Note that the Middle East and North Africa regions having above average road accident rates. UAE have made huge strides in terms of building infrastructure and increasing longevity and increasing per capita income of the residents over the years. The only thing lacking in lack of awareness. Below is the comparison of UAE with other industrialized countries around the world shown in Hans Rosling's Gapminder . The graph below shows deaths per 100,000 around the world with per capita income of people. Though UAE is high in terms of per capita income when comparing with industrialized countries, the country has appalling record when one compares 32 deaths per 100,000 comparing to UK's 4 deaths per 100,000. According to WHO, residents of UAE are 7 times more likely to die in car accident compared to those in UK. Road accidents are the second major cause of deaths in UAE and deaths due to accidents have been increasing every year (with exception of 2009 when deaths decreased by 10%). It is also sad to note that road accidents are primary cause of deaths of children in UAE (63% of children deaths are due to accidents), 90 percent of children are unrestrained and many die to injuries suffered during the accident. Abu Dhabi is the largest city of the UAE and has population of about two million. The Health Authority of Abu Dhabi (HAAD) has done a great job collecting statistical data of the common causes of deaths in Abu Dhabi. It shows that 63% of deaths are caused by Road Traffic Accidents. How are road traffic accidents (RTA) caused and what are the factors contributing to Road Traffic Accidents? 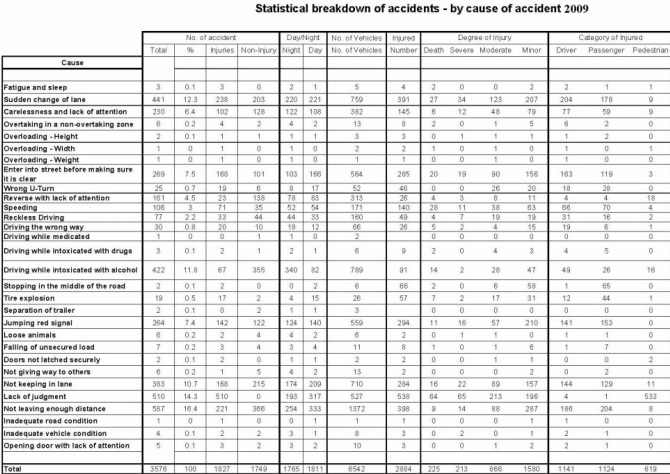 Below is the table showing list of causes for driver accidents. As you can see most of them are due to recklessness and the careless attitudes of the drivers. Most of the experts suggest this could be changed by educating drivers of proper driving and showing courtesy to other drivers. Our suggestion is to change their attitudes! The question then arises about the methodology on how we can UAE reduce the number of deaths in long run?